Last month I made a trip to Dubai in United Arab Emirates and Doha in Qatar. This was my first trip to the Middle East so I wasn’t really sure what to expect. We went to Doha to watch a MotoGP race, so we didn’t really see much of the city, so I will only comment on Dubai here. The MotoGP race deserves a posting on its own. The pace of development in Dubai is overwhelming. There are cranes and road construction absolutely everywhere. I used to think the Las Vegas strip was growing quickly, but this is on a completely different scale. The population in 1969 was 60,000. Now it is 1.8 million. Not only is there a lot of construction going on, the scale of the building is amazing. 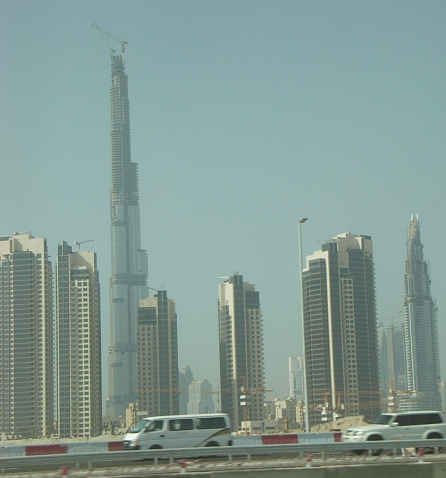 We saw Burj Dubai, the worlds tallest building, under construction. There are also huge malls going in. One condo building was saw advertised had 120 floors. It’s hard to tell in the picture below, but Burj Dubai is surrounded by a lot of other building under constructions. It’s like they just decide to build a new city and put it up in a few years. Dubai is very cosmopolitan. 80% of the population of Dubai is from outside of the UAE. This makes English the common language for everyone. Almost everyone we met spoke very good English (there was one cabbie who seemed to have a little trouble understanding us) and all the signs that we saw were in English only or English and Arabic. Any tourist who speaks in English will have no problem getting around. All the new development and the prominent English actually made things a little less interesting from a traveling point of view than I imagined. 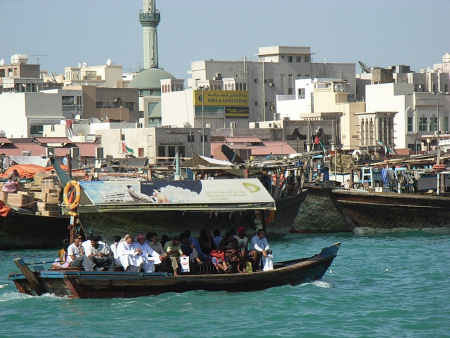 It is very hard to find any type of culture in Dubai. 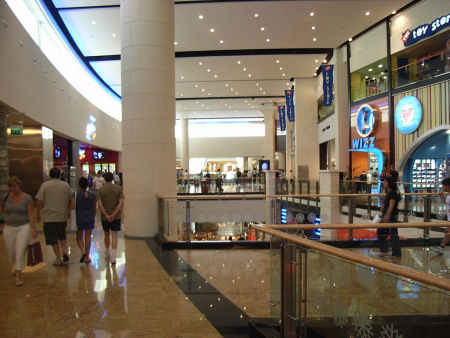 Walking through the Mall of the Emirates (currently the biggest mall outside of North America until the next mall is finished in Dubai) was like walking through a mall in any suburb in the US or Canada. That being said there were some interesting things I hadn’t experienced before. All the loudspeakers blaring prayers from the mosques five times a day was different. We also went to check out the Souks (markets) in the older part of town (but really not that old, we have older building in L.A. and that’s not saying much). To get to the Souks we used a Dhow (ferry boat, see picture below) to cross Dubai Creek – that was a pretty interesting experience. This entry was posted on Thursday, April 10th, 2008 at 6:23 pm	and is filed under All, Travel. You can follow any responses to this entry through the RSS 2.0 feed. You can leave a response, or trackback from your own site.